Let’s talk about this relentless winter. Like a demanding toddler, this winter has been running around all over the country with its snow and ice, and if for one minute we seem to be forgetting about its power, it wallops us to get our attention. We have been at the mercy of frequent snow storms in the Northeast. Last week, I had not one but TWO snow days off from work. I am fortunate enough to be in a position where having a few days with the office closed doesn’t put me incredibly behind at work, nor threaten my vacation days. I’m not in danger of having a shorter summer, like the teachers, and I don’t have kids to scramble to find care for or to keep entertained myself. For me, these days can be viewed as wonderful gifts. I should be thrilled to have extra time to cook, or to take care of my task list, or take on creative projects. The truth is, both of these days went by very quickly. The main feeling I had, by the end, was that I was cooped up in my house. I missed my routine, and felt a little lost having such open chunks of time. It is nice to have somewhere to go every day, even if you don’t necessarily love the place you’re going. I get the feeling that you all might be a little tired of these disruptions too? For some reason I wasn’t drawn to cook those days; in fact, I had a hard time pulling myself from the computer, which is dangerous because lengthy computer use can sometimes negatively affect one’s mood. I did use one of the days to leisurely prepare these chocolate hazelnut linzer heart cookies from Smitten Kitchen. It required me first to trudge around or through uncleared sidewalks and in the traffic lanes of slippery roads to the corner store for Nutella (why didn’t I have Nutella on hand? Good question.) It was worth it. On Monday (another day with extra time because of the President’s Day holiday) I decided I wanted to prepare simple sandwiches for my husband and me. Hot paninis to be exact, because a cold sandwich never quite satisfies to the same level–my husband feels this quite strongly. A week or so earlier we had an awesome portobello mushroom panini out at dinner, so I picked up a few caps thinking I would give it a shot. It helped that, once again, we had a some of his delectable homemade bread on hand. This sandwich was great for using what I had hanging around, including some of a Costco-sized sliced cheese assortment. Heat your grill pan. 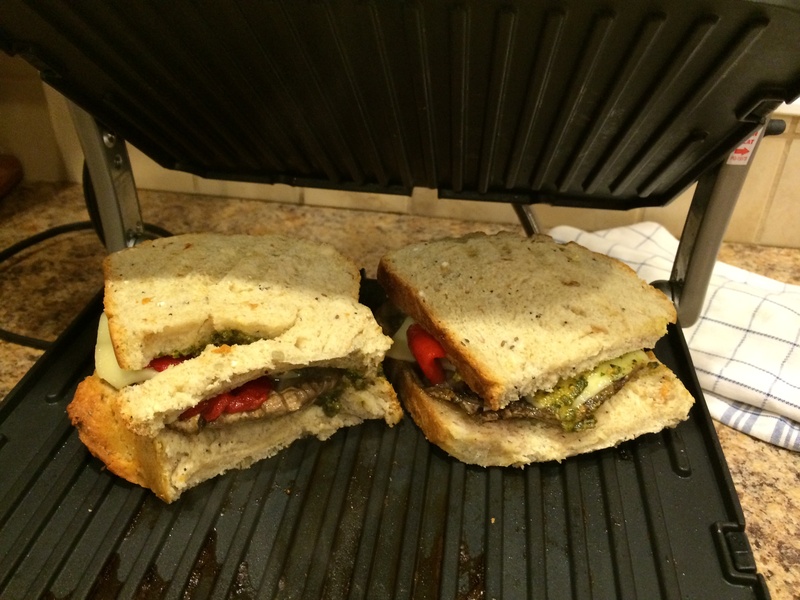 You might have a stovetop grill pan that works, or like us, a Cuisinart “Griddler” which is ideal for paninis. A grapefruit spoon works great for de-gilling. 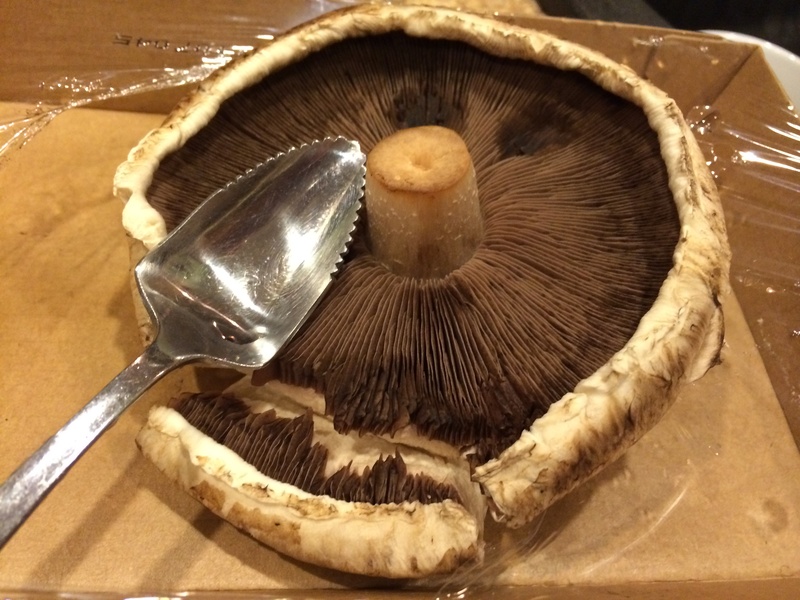 Brush both sides of portobello caps with olive oil and sprinkle with salt and pepper. 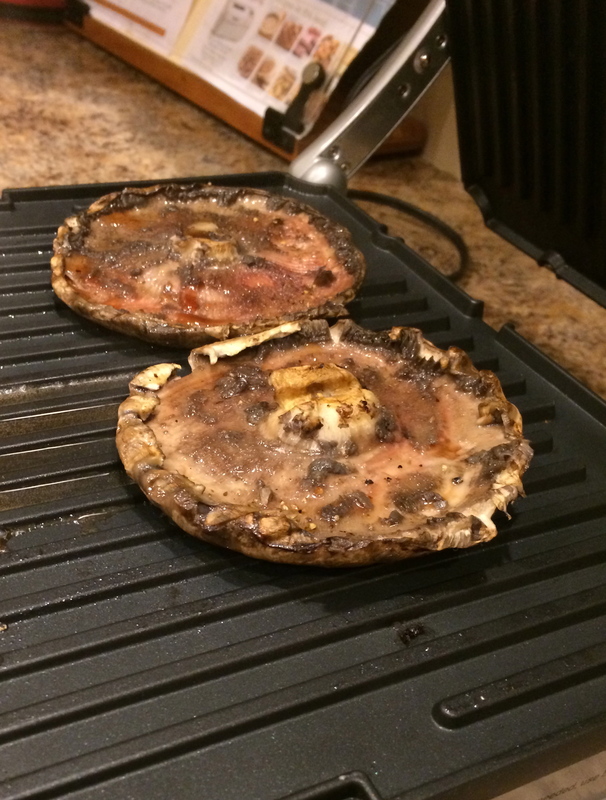 Place mushrooms on grill and cook on medium for several minutes on each side, until soft. De-gilled mushroom caps on the Griddler. Top mushrooms with cheese so that it melts while the mushrooms are still over heat. Set aside on plate, temporarily. 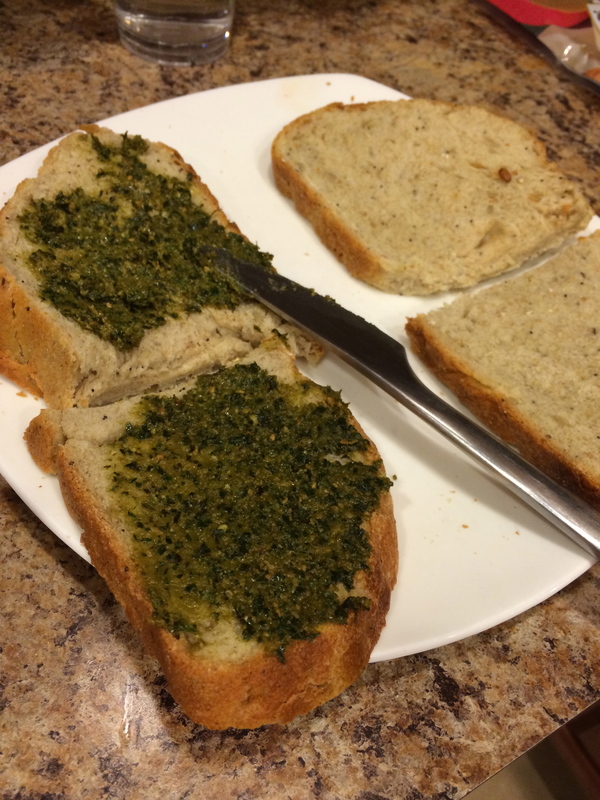 Meanwhile, spread about 1 Tablespoon of pesto on each slice of bread. Layer sandwiches grilled portobello, cheese, and roasted red pepper. 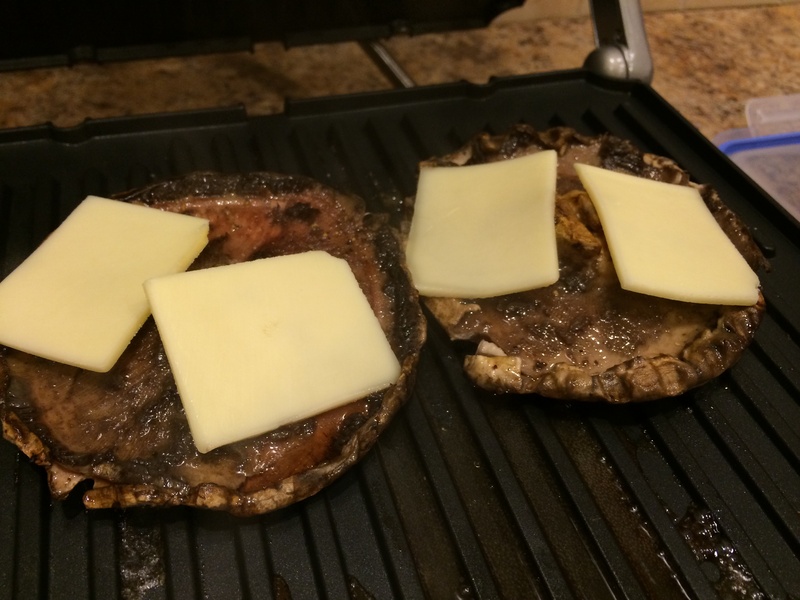 Return to the grill/Griddler/panini press to further melt the cheese and toast the bread. You may want to brush a little olive oil on the surface of the bread. You might notice that these photos look a little below par–I was SO lazy that I didn’t even get out my SLR camera, so these were taken on the iPhone. Remember my urge to preserve? We are enjoying this same basil pesto from the summer! 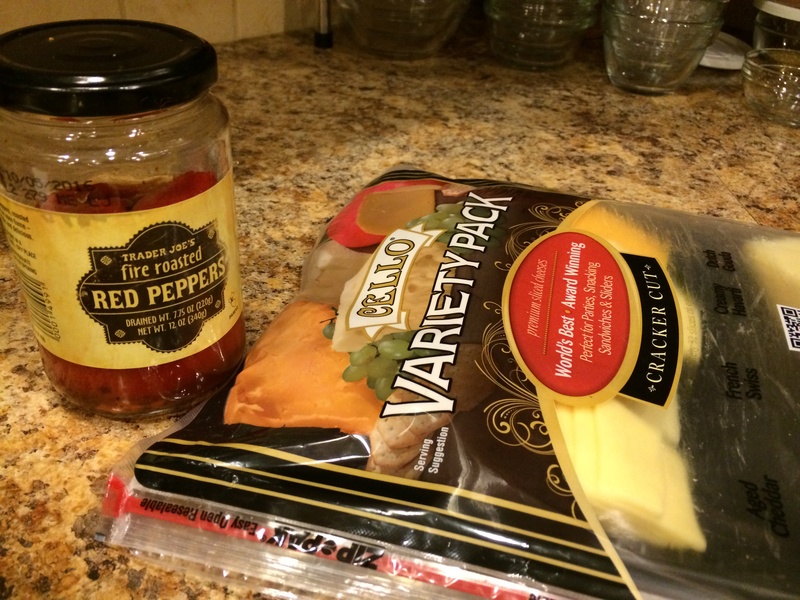 I could have made and jarred my own red bell peppers too. Now, in the middle of winter, we can enjoy a taste of summer flavors. We’ll just keep the shades closed so we aren’t so keenly aware of the mess outside. 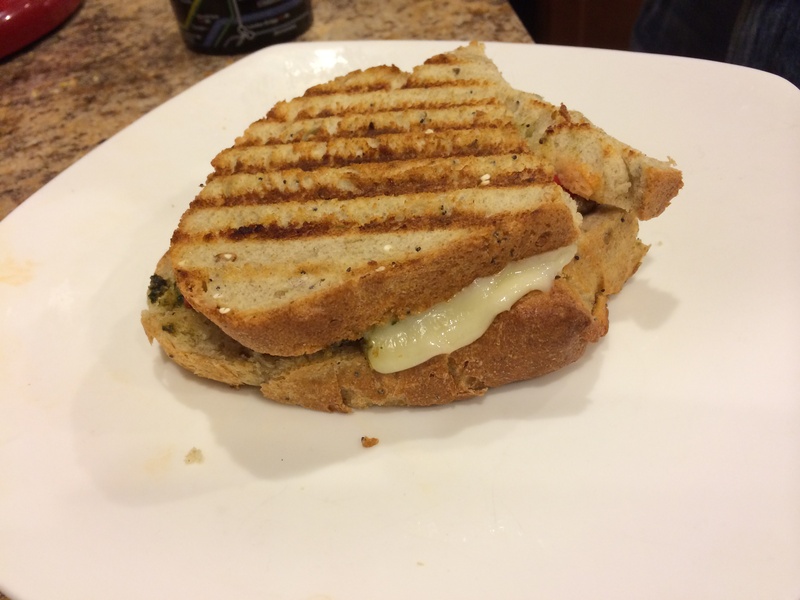 This entry was posted in Fast and easy, Recipes, Sandwiches, Vegetables, Vegetarian and tagged mushroom, panini, pesto, portobello mushroom, roasted red pepper, sandwich. Bookmark the permalink. These look delicious! The bread looks amazing. I made Deb’s Linzer cookies too- they were delish! I did a few with raspberry jam filling instead of Nutella. Also, the new blog design looks great. I made some with cherry jam too! I thought they were just as good. Thanks for the feedback!